^ "Robert Kardashian net worth". Richest celebrities. Retrieved March 16, 2016. ^ "Obituaries". The Desert Sun. May 28, 2008. ^ "Helen Kardashian - Kim Kardashian: Official website". Kimkardashian.com. Retrieved 2015-05-14. ^ Conovaloff, Andrei. "Taxonomy of 3 Spiritual Christian groups: Molokane, Pryguny and Dukh-i-zhizniki — books, fellowship, holidays, prophets and songs". Spiritual Christian Around the World. Retrieved December 27, 2016. ^ Harvey, Oliver (March 16, 2012). "Kim Kardashian is keeping up with the Armenians". The Sun. London. Retrieved September 3, 2012. ^ a b Beth Shuster, "Kardashian-Simpson Bond Stands Test of Time, Trouble", Los Angeles Times, July 6, 1994. ^ "Who Was Robert Kardashian, Sr.?". Wetpaint. Retrieved 22 February 2016. ^ "The People v OJ Simpson: Who was Robert Kardashian? (Aside from Kim's dad)". The Telegraph. Retrieved 22 February 2016. ^ "Robert Kardashian, a Lawyer For O. J. Simpson, Dies at 59". The New York Times. Retrieved 22 February 2016. ^ "50 Things You Probably Didn't Know about Kim Kardashian". Boomsbeat. Retrieved 22 February 2016. ^ "The Kardashians' bizarre involvements with O.J. 's trial". Looper. Retrieved 22 February 2016. ^ Eric Malnic (October 2, 2003). 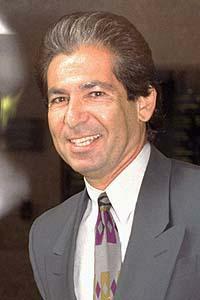 "Robert Kardashian -- friend and lawyer of O.J. Simpson". Los Angeles Times. Retrieved 22 February 2016. ^ "Photo of Robert Kardashian with his children". What's Good? Online. ^ Dominick Dunne, "Three Faces of Evil" Vanity Fair, June 1996. ^ Mike Fleeman, "Stand By Your Man", Los Angeles, October 1996. ^ "Stand By Your Man". Los Angeles Magazine. Oct 1996. Retrieved April 10, 2016. ^ Mohan, Keerthi (October 9, 2014). "Bruce Jenner Might have Called it Quits with Kris Jenner Because of her Children: Report". International Business Times. Retrieved April 19, 2015. ^ "Declaration of Robert Kardashian" (PDF). TMZ. Retrieved April 19, 2015. ^ Amber Garrett (June 10, 2013). "Who is Robert Kardashian's Widow, Ellen Pierson Kardashian?". Wetpaint. Retrieved April 10, 2016. ^ a b c Reed, Christopher (October 6, 2003). "Obituary: Robert Kardashian". The Guardian. London. Retrieved November 22, 2010. ^ "O.J. Simpson trial: Testimony about Simpson's trip to Chicago". CNN. October 11, 2007. Archived from the original on March 5, 2012. Retrieved October 17, 2011. ^ Lowry, Brian (June 21, 2010). "From the couch: O.J. 's legacy continues". Fox Sports. Archived from the original on July 15, 2010. Retrieved November 22, 2010. ^ a b "Robert Kardashian, a Lawyer For O. J. Simpson, Dies at 59". The New York Times. October 3, 2003. Retrieved November 22, 2010. ^ "O.J. Simpson lawyer, Kardashian, dies". CNN. October 1, 2003. Retrieved November 22, 2010. ^ Gnerre, Sam (July 26, 2014). "The Inglewood Park Cemetery predates the city's incorporation". Daily Breeze. Retrieved 2016-04-18.